Press release - GE Global Research and GE Consumer & Industrial in conjunction with ECD announced the successful demonstration of the world’s first roll-to-roll manufactured organic light-emitting diode (OLED) lighting devices. This demonstration is a key step toward making OLEDs and other high performance organic electronics products at dramatically lower costs than what is possible today. . . .
OLEDs have the potential to deliver dramatically improved levels of efficiency and environmental performance when compared to traditional products. When commercialized this technology will make possible low cost high, efficieny lighting. Lighting currently comsumes about 22% of the total electricity generated in the U.S. and about 25% of the average homes electric bill. Thanks to Tyler at Clean Break for the tip. That's pretty neat, buyt I don't quite understand how this will help our mitigation from Peak Oil. I know this can help curb someof the demand, but could this curb a good chunk of it? This is less about peak oil than reducing our power needs at home and at work, thus reducing CO2 emissions. This is a demonstration of the actual manufacturing process, which is a huge step. Are we talking about commercial lighting here? I don't think so. OLED's are not designed for high output. However, OLED's *are* set to displace LCD panels in display technology -- requiring no backlight and thus being far thinner and more energy efficient. This means, once cost and longevity issues are solved, your iPod or cell phone will use an OLED display which will greatly improve battery life and form factor, and your future TV will have tremendous contrast ratio's and be 5mm thick. If there is an improved technique for manufacturing OLEDs wouldn't that be applicable to the manufacture of thin-film PV cells since they're both organic electronic techs? Regardless, it's great progress. To my mind conservation of energy is as vital as clean generation in working towards sustainability. "That's pretty neat, buyt I don't quite understand how this will help our mitigation from Peak Oil." It's beginning to look like our personal post-petroleum transportation will be largely electrically powered. Anything that reduces electricity consumption (US currently expends 22% of its electricity for lighting - above) frees more electricity for transportation. For area lighting, OLEDs are not yet on par with alternatives like flourescent. From another article the GE panels are 30 lm/W-- twice incandescent, but much less than fluorescent or sodium vapor. See a table of lamp effiency-- ranging from 10 to 200 lm/W for different technologies. 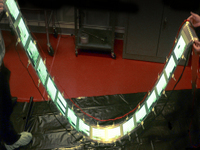 There is research on future possible OLED improvements to be on par with fluorescent. OLEDs can be great for low power video displays because light can be emitted directly instead of existing LCD or projection displays that create white light and then block most of it to make shades of color. We should also remember that improvements in at-home energy efficiency mean more spare capacity for charging your future electric or plug-in hybrid car that uses little or no oil. It's all one energy system. Most electrical energy is produced via natural gas or coal, not oil. So, the impact on oil imports might be relatively insignificant. However, less is always more when it comes to energy, at least when the same things can be accomplished using less of it. That's called efficiency. Less power plant demand also means less CO2, mercury and dioxin posioning of our air as well. catmul: Applied Materials, which manufactures equipment for semiconductor processing, was able to expand on their flat panel equipment experience to get into the area of supplying equipment for thin film solar. So it is indeed possible, that the physics, and manufacturing experience might carryover into something useful for PV. Zero is the number of cases of of CO2, mercury and dioxin poisoning in 2007 from operation of electricity generating plants. Good record right KAHruzer? 47 human deaths from mining coal in the USA in 2006 is not so good. How many tons of mercury are emitted every year by coal-fired power plants? How many tons of CO2? Right now, coal accounts for about 50% of all electricity generation in the United States. This resulted in the emission of ~2.5 billion tons of carbon dioxide to the atmosphere, along with ~12 million tons of sulfur oxides, ~4 million tons of nitrogen oxides, around half a million tons of soot particles, and a number of toxins: about a hundred tons each of arsenic, lead and mercury. How many people did that kill? The EPA isn't keeping count - according to their website, "Also on March 15, 2005, in a separate but related action, EPA revised and reversed its December 2000 finding that it was “appropriate and necessary” to regulate coal- and oil-fired coal-fired power plants under section 112 of the Clean Air Act. " That's what happens when fossil fuel industry reps are appointed to head the EPA, right? In comparison, solar and wind power emit nothing in the course of power generation - nothing at all. Furthermore, there is sufficient sun and wind energy to easily supply the entire U.S. - every single coal-burning plant could be shut down without ill effect. This is a documented fact - try http://www.solardaily.com/reports/Solar_Thermal_Power_Could_Supply_Over_90_percent_Of_US_Grid_Plus_Auto_Fleet_999.html for example. This will eventually happen - every single coal-fired power plant in the U.S. will be closed and replaced by clean renewable energy - it is just a matter of time. OLED or LEDs lights are getting very close to florescent light output i.e. an average of 75 lumens/watt. However the price is still about 10X. Will the GE process reduce OLED price up to 10X? Since LEDs may last 3 to 5 times longe, some people wouldn't mind paying a bit more. From a power saving point of view, they are not ther yet. OTOH, OLED video displays would use at least 1/3 less power and eventually perform better than LCDs. I'll have to dig it up later, but as I recall, lighting consumes about 9% of U.S. electricity. Actually this is a very good mine safety record. Try comparing it to 5000 in China. Here is the deal. All power plants must meet safety and environment regulations and standers . DavidJ and Ike want to ignore benefits of coal generated electricity while ignoring the safety risk and environmental impact of wind and solar. Conservation and renewable energy have merit in their own right. 47 deaths is "quote a very good safety record." Why don't you ask a US coal miner if they think that is "good record"? "DavidJ and Ike want to ignore benefits of coal generated electricity while ignoring the safety risk and environmental impact of wind and solar." How do the hazards of solar and wind electricity production compare to the deaths caused by pollution from burning fossil fuels? How dangerous are PV panels and wind towers compared to the increases in cyclonic strength which seem to be caused by global warming/fossil fuel use? Are PV and wind farms causing flooding problems like those caused by strip mining? Bob, the safety and environmental impact for coal, nuclear, wind, and solar are about the same in the US. Regulations require that the impact of producing electricity be insignificant. As part of a group of people in the industry who work 24/7 to ensure electricity is available when needed, I am proud of our record. I get tried of idiots like Bob, drydock, ike, and DavidJ implying that they somehow do not have a clean safe environment with all the benefits that using electricity provides. Like denigrating those who make their lifestyle possible using electricity to blog on the Internet. So guys what is the safety and environmental impact of your contribution to society? Well Bob, you do not think the materials for wind and solar came from a magic wand? Mining. Anyone who as looked at a large solar or wind farm would be hard pressed to explain how the alteration of the natural land is much different than a strip mind. I saw a wind farm placed on the reclaimed land from strip mining. If there was a blight to the landscape, it was the windmills. Last year, I worked died when a windmill in the PNW collapsed. Even though I think they are blight to the landscape, I still think windmills should be built. However, a root cause of the accident should be determined to prevent future deaths. Kit, I really am put off by your continued obnoxious behavior on this site. You gain nothing by name calling. You simply paint yourself as an unpleasant person, perhaps best avoided. Would you please make an attempt to participate on this forum as a mature adult? Global warming, caused at least in part by burning of fossil fuels, is predicted to increase deaths from airborne pollution. "(R)esearch shows that one out of every six women of childbearing age in the United States may have blood mercury concentrations high enough to damage a developing fetus. This means that 630,000 of the 4 million babies born in the country each year are at risk of neurological damage because of exposure to dangerous mercury levels in the womb." "In the United States, 23,600 deaths each year can be attributed to air pollution from power plants. Those dying prematurely due to exposure to particulate matter lose, on average, 14 years of life. Burning coal also is responsible for some 554,000 asthma attacks, 16,200 cases of chronic bronchitis, and 38,200 non-fatal heart attacks each year. Atmospheric power plant pollution in the United States racks up an estimated annual health care bill of over $160 billion." The major inputs for PV solar are silicon and aluminum. Obtaining the raw materials for neither require the sort of mining that is currently destroying mountains in the Eastern US. Wind towers, to me and some others, are things of beauty. I suppose it's a required taste, arising from the realization that they are a first step toward moving us to a coal/oil/nuclear future. Impact to wildlife? Excepting the initial design problems at Altamont, wind towers have been shown to produce minimal harm to wildlife. How much wildlife is destroyed by increased intensity tornadoes and hurricanes? Now, at no time have I denied that affordable electricity has improved our lives. I've lived for significant periods without access to cheap energy and appreciate what technology has brought us. But I'm not satisfied with stopping where we are when we can do better. We have a possible path a better future in which we can have both cheap power and a better environment. And we can get there while improving the US economy. To not pursue that future makes no sense to me. Please note that my first three responses in this tread were very civil. Bob wants to be nasty and does not understand why he gets a nasty responds. Bob, you continue to make the most heinous allegations based reading the newspaper and other junk science sources and you think wind towers are a thing of beauty. Well Bob it is really hard to have a mature civil discussion with you. If you are offended by me calling you an names, stop accusing people of killing people. Bob, is inferring nasty things better? From Bob, "(R)esearch shows that one out of every six women of childbearing age in the United States may have blood mercury concentrations high enough to damage a developing fetus. This means that 630,000 of the 4 million babies born in the country each year are at risk of neurological damage because of exposure to dangerous mercury levels in the womb." Bob this is just not true. This is in fact shameless fear mongering on the part of journalist. If you go to the CDC site, you will find that research show all subjects tested were below the threshold of harm. This of course means that none were at risk for mercury. Everyone has levels of mercury in their blood because mercury is part of the natural environment. Second Bob, you and no one has yet found anyone with high mercury with the source being a coal plant. In fact mercury poisoning is very rare in the US these days since it has been tightly regulated but coal power plants were never a major source and only became a the largest source when large sources were eliminated. Bob is lying about mercury. He has relied on journalists to provided his information. There is lots of information on this topic for those mature enough to sort through facts and draw unbiased conclusion. I think Bob has a also has problem with the word 'insignificant'. Now Bob, I have lived near many coal fired power plants and have always had good air quality. I have noticed that the farther you get from the coal power and the closer you get a city with lots of cars, the air quality goes from good to bad. Now Bob if you want to blame heath issues related to urban air quality on coal what should I conclude about your metal abilities and maturity? Is Bob being nasty, in his characterization of those hard working folks that supply you energy. I am offended that you use the word 'we' because Bob I suspect your only contribution to a better environment is blaming others. I do think that it a brilliant observation on Bob's part to think better is better. My experience with government data published on lighting as a % of total electric load in New England office buildings last year was that it tended to overstate the amount of load that could be attributed to lighting. If the intent is to see how much of the lighting load can be freed up to use in other areas such as charging vehicles, you should look at it regionally. In areas such as the Northeast where electric rates are high and there have been a large amount of DSM Programs (Demand Side Management) implemented by the electric utilities, there will not be as much potential to free up additional load as in areas were electricity prices are low and the electric utlities have not been agressive with Demand Side Management Programs. This is due to the fact that in the energy conservation business the lighting is usually the easiest to do and is done first. Second Bob, you and no one has yet found anyone with high mercury with the source being a coal plant. At least one study has found a person with toxic levels of mercury from fish, and mercury in freshwater fish in Wisconsin comes primarily from coal-fired powerplants. In other words, Kit P is lying again. Should we be surprised? E-P is both wrong and an idiot. First he is an idiot for suggesting I am lying based on reading a paper that is outside his engineering field expertise. Since I am an environmental engineer who is trained and has been paid to do risk analysis, I will explain why E-P is wrong. No blood or hair samples were taken from the fishermen. Interviews were conducted to determine the fishermen's consumption for input into a mathematical model to determine risk. Second, the the study does not say 'mercury in freshwater fish in Wisconsin comes primarily from coal-fired powerplants' but that it comes from a point source. There are many legacy point sources of mercury like smelting or paper pulp plants. Finally, the model in the study found no one “with toxic levels of mercury from fish.” The results showed that 95% were below the NAS threshold of risk. The 5% of men who were at risk if they happen to be a developing child. Of course, the effects of a toxin depends on the individual. Hence, we talk about risk. If you go to a doctor with symptoms, the doctor will test you to see what the cause is. Since E-P lives in a nanny state he may not understand risk. The state is spending lots of money wondering why those who risk going out on the ice in brutal weather do not listen to state advisories about insignificant risk. There is clearly a mercury scare campaign that is unwarranted based on present regulation reducing the risk to an insignificant level. kitp are you that obnoxious in real life too? whenever someone makes a point you disagree with you call them an idiot etc? all these comments about powerplant safety and regulations etc.. are only there because they were imposed on the industry - regulations which the industry fought tooth and nail..as they are doing now. Here is the interesting thing petr. We who work in the electricity generating industry like to come home at night in the same condition as left. We also live in communities with power plants and like a clean environment. However, being called baby killers and lairs by clueless punks who are only too happy to waste our product gets old. So who is fighting mercury regulations now? It is environmental groups and democrats. New regulations that could have gone into effect under Bill Clinton would reduce mercury by 70%. Bush and the coal industry have not fought such measures. The enemy of good is perfect. I personally have more problem with paying more for electricity if it would reduce the risk of mercury toxicity in children. However, zero is just about as small a number for risk as you can find. one out of every six women of childbearing age in the United States may have blood mercury concentrations high enough to damage a developing fetus. Now, he may be correct: it probably is impossible to trace any given impairment to coal combustion, just as it is impossible to trace any given lung cancer to smoking (it has a non-zero incidence even among people never exposed, and we can't trace all influences years after the fact). However, that's mere sophistry; the epidemiological evidence is good enough. If we want to burn coal, we should be doing it in oxygen-blown IGCC plants with activated-carbon filters to take metals out of the syngas. These can also scrub 99+% of the sulfur, extract on the order of 25% of the carbon as CO2 in the acid-gas removal step (which can be sequestered and eliminates the need to separate and convert the H2S), and boost efficiency to roughly 40%. The problem with IGCC has so far been high costs due to expensive gasifiers, combined cycle turbines, advanced material requirements (temperature, pressure, syngas related) etc. It's improving but still quite expensive. And the efficiency isn't good. Modern large subcritical plants with reheat come in at about 40-ish percent net electrical efficiencies, and commercial supercritical plants have been built with more than 45% efficiency but with only a few percent higher costs than modern subcritical ones. The efficiency gain in combined cycles is negated by having to break down the coal hydrocarbon bonds, because these bonds are relatively strong. The latest gasifiers still lose about 20% of the initial chemical energy in the coal, in converting it to syngas. Using a somewhat optimistic 60% net electrical efficiency CCGT, and 80% gasifier efficiecy, that's only 48% net electrical efficiency with the latest technology for IGCC. Which is expensive compared to a supercritical plant with similar efficiency. And there's more technological risk with the IGCC. Still, the option of taking out the metals in the syngas prior to combustion could be an advantage. Considering the high specific gravity of metals, I wonder if it would be possible to use centrifugal forces to separate the metals post-combustion? Would it be effective and efficient enough? Sorry E-P your source (EPI) is not very credible ans apparently you do not understand the difference between evaluating toxicity and cancer potency. While we need to give E-P credit for continually posting on topics he does not understand, I do not expect E-P to understand the following reference. Centers for Disease Control and Prevention. Third National Report on Human Exposure to Environmental Chemicals. Atlanta (GA): CDC, 2005. The point here is that regulating to reduce a hazard where toxic levels are above the threshold of harm can reduce the toxic effects. However, mercury levels are below the threshold of harm. There is no smoking gun for environmental mercury exposure and only a small percentage is even close to the very conservative level of harm. Well, damn. My rebuttal and Kit P's reply (laden with red herrings like "cancer risk", when my reference didn't even mention cancer) appear to have been deleted. This process should speed up development of low power consumption large screen OLED TV models. With any luck they will start to replace energy hogging plasma TV's in the near future. This technology from GE looks impressive it is good to see that the manufacturers are spending money on new product development in keeping with all of the current environmental concerns. this is such good cool technology. I just love the new technology. GE has considered great technology and better quality which is looking in its product and service. Cool updates!!! I can feel that you have put in hard efforts. Good job!! That is very great to built the unique equipments. Which helpfull in the demonstration. Thanks for your guidance. All about OLED Displays and more information about Organic liht emitting diode! You have posted a great blog.But According to me you should also provide the information about-How these organic Light Emitting Diodes are useful in our daily life. Realy would like to say thanks to all of you guys. Shairing Knowledgeble information here. I feel your blog really useful and inspiring me. Thank you. Explore your options for healthy aging. Find research and information on the health benefits of resveratrol, the miracle polyphenol found in red wine and its miraculous antiaging benefits. Resveratrol research suggests it has antiaging, anti-inflammatory, anti-cancer, anti-oxidant, and cardiovascular benefits. I have always enjoyed seeing innovations in technology. It has amazed me how far we have come in lighting technology over the past few years. As we continue to improve on the technology we will eventually see this technology in our homes. Nice creation by home renovation is like the it’s made by the lord. So it wonderful thing and these so much good. GE researchers provided the organic electronics technology and were responsible for developing the roll-to-roll processes, while ECD provided its unique roll-to-roll equipment-building expertise to build the machine that manufactures the OLED devices, nice and informative article, Thanks.